Whether its a giant fundraising gala, a business conference, or a wedding in your parent's backyard, event planning can be incredibly stressful. Last month, I was involved in planning three big events, and let me tell you: I'm exhausted. Commonly characterized by: "My event is still nine months away. I don't need to start planning for it yet." Or, it's still two months before the big event and you still haven't sent in the required site permits. You'd rather drain your phone's battery on Pinterest than figure out which vendor to work with. Sometimes, the list of to-do's is so long that you don't know where to start. But it's OK. You've still got time. 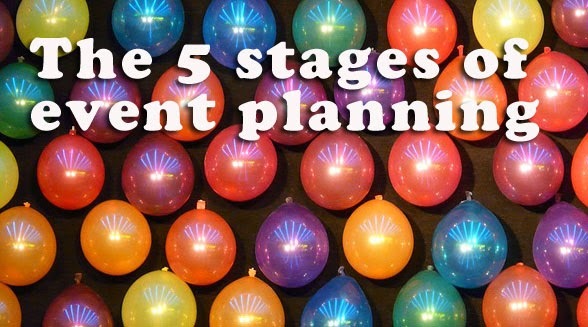 Your event planning committee is driving you nuts. Your volunteers are driving you nuts. Your boss is driving you nuts. Your boyfriend is driving you nuts. The person who messed up the floral arrangements is driving you nuts. Basically, everyone including your dog is driving you nuts!!! You find yourself asking everyone and their second cousin for a favor. "If you buy a ticket to my event I'll buy you a drink!" "If you sign up to volunteer I'll be forever in your debt!" "If you print 100 color copies I'll take you out for coffee!" "If you help me make these centerpieces I'll sell you my soul for half price!" A few days after the event, it hits you like a brick: Now that your event is over, there is no meaning in life. What is the point of breathing if you don't need to micromanage a team of 12 volunteers anymore? You're totally burnt out from working a 16-hour shift on Saturday. Oh, and you'd rather not have to think about all those thank you notes you still need to write. Fellow event planners: Can you relate? This place is gorgeous. It has very high ceilings and huge windows offering a tremendous view of the city. The food was also good, on par with normal function type dining. Event management is really a creative job. You need to hire a best event management company for your corporate or personal events. Thanks for sharing such an amazing post.